There is not a lot to work with in this Gospel and I preached about the second paragraph just a few weeks ago. All we have is that the Spirit drove Jesus into the desert among the wild beasts where he fasted forty days and nights, was tempted by Satan and ministered to by angels. 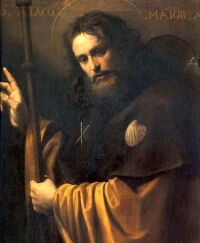 James was the brother of John and the son of Zebedee. His life changed when Jesus came along and asked him to follow him; he dropped his nets and left with his brother. He was chosen by Jesus to be one of the twelve apostles, given the mission to proclaim the good news, and authority to heal and cast out demons. To be named one of the twelve James must have had faith and commitment. He saw Jesus preach in the synagogue, heal Simon’s mother-in-law, raise Jairus’ daughter, be transfigured and pray in the Garden of Gethsemane. Acts 12:1 tells us that James was one of the first martyrs of the Church. King Herod Agrippa I killed him with a sword in an early persecution of the Church. There is a story that the man who arrested James became a convert after hearing James speak at his trial and was executed with him. James is called James the Greater because another younger apostle was named James. He should not be accused with this James, or the James who is a relative of Jesus, or the James who was an elder of the Church in Jerusalem and heard Peter’s defense of baptizing Gentiles. James, son of Thunder, was dead by then. Legends have sprung up that James evangelized Spain before he died but these stories have no basis in historical fact. Though it is unmistakably Christian, this book has a very Jewish feel to it. Jesus is mentioned by name only twice (1:1, 2:1), and there are no references to the saving effects of his death and resurrection or to the gift and work of God’s Holy Spirit. Instead, there are a lot of do’s and don’ts, like a guidebook down the path of life. There is still debate among theologians who wrote this epistle. It is most widely attributed to Jesus’ “brother” James, who became the leader of the church in Jerusalem (James the Just, not the apostle). The letter starts as being addressed to the twelve tribes in the dispersion, which could mean descendants of Abraham (12 tribes) or Jews who live outside of Palestine (dispersed). Metaphorically, it could be Christians who are the new Israel (as a select group) or all Christians dispersed on the earth. The ambiguity speaks to what the writer was probably feeling at the time, and his audience. Christianity was so new (Powell, Intro. the New Testament, p. 445-450).. We don’t even know when it was written, whether 60s or perhaps later in the 80s & 90s. Despite the reflection of Jewish Christian traditions, the writing itself suggests a Greek-speaking Jewish community because of its elegance (Perkins, Reading the New Testament, p. 297). So there is mystery with James the Apostle, James the Just and this letter. We will sit with this mystery and see how it helps us in our Lenten journey. Most letters start in thanksgiving…not James! He tells us to consider our trials and difficulties with JOY! Difficulties show our true worth. They make us stronger and help us see perspective. How does this show in your life? He encourages us to seek God with a full heart with our troubles. Doubt makes us unstable, a “man of two minds”. Have you ever been torn in your faith? What happens when we are of two minds? James also tells us that we are not only to talk the talk but walk the walk. He draws a picture that when we don’t do as we say, it is like looking at ourselves in the mirror, having forgotten what we looked like. What does this mean to you? You know Job would have been a horrible basketball coach. Can you imagine this pre-game speech? “If in bed I say, “When shall I arise?” then the night drags on; I am filled with restlessness until the dawn. My days are swifter than a weaver’s shuttle; they come to an end without hope. Remember that my life is like the wind; I shall not see happiness again.” Now go out there and get them. Have you ever been able to identify with this leper? Perhaps you didn’t have anything visibly embarrassing on your person, but maybe you were self-conscious about something? Or felt the world knew something wrong about you? We sometimes have a little voice inside of us that counts us unworthy, unclean, unlovable. But Jesus saves! We must turn to Jesus’ voice, and He will make us feel worthy, clean and lovable again. A good reading to contemplate as we head towards Valentine’s Day. Last week, we learned from Simon Peter’s mother-in-law that when we are touched by Jesus, we must ‘rise up and serve.’ Now we see a leper who proclaims freely the good news of salvation (full health and life) in the love of God we find in Jesus. literally this phrase means to have one’s intestines turn over . . . Yet, this leper had dared to ignore the law’s strict rule of quarantine. In this reading, Job is answering his friends who say he is suffering because of his sin. What do you make of his words? What dialogue do you have with God concerning suffering? Before this passage, Mark tells of Jesus teaching in the synagogue in Capernaum and casting out demons (last Sunday’s gospel), and then the day goes on with this reading –Mark is presenting dramatically a ‘typical’ day in the life of Jesus who is intent upon proclaiming and ‘preaching’ God’s Kingdom. What do we see of God’s kingdom here? John Pilch points out that in Jesus’ culture Peter’s mother-in-law should have been living in her husband’s family home – or — if he was dead, then, she would be with one of her sons. The fact that she is in Peter’s house suggests that she may have no other living family members to take care of her. This woman may have known a lot more sorrow than just this fever. When Jesus touches her, she rises up with energy and purpose in her life. Jesus seemed to have helped her regain her meaning in life. This was beautifully expressed by her eager service. What do you see in her story? Comfortable Christianity is an oxymoron. We like to imagine those in a deep relationship to God to be peace-filled . . . But to be honest, the most ‘responsive,’ committed Christians . . . are often ‘driven,’ compelled –with at least some measure of agitation and turmoil . . .the calling [from God] deep within – if heeded – is almost guaranteed to increase sensitivity to the demands that abundantly present themselves! There are always more hungry mouths to feed, more injustices to deal with, more violence to be overcome, more broken hearts to be healed . . .Yet “while it was still dark, Jesus got up and went out to a deserted place, and there he prayed.” It was from that quiet place that he moved on . . .